Yucatecan cooking is a delicious combination of European and Mayan flavors. It’s also considered one of the best types of regional Mexican food due to its flavor and the interesting ways in which it’s prepared. Visitors to Yucatan (the state right next to Quintana Roo, home of Cancun) and the surrounding area leave with a lovely taste in their mouths combined with their memories of the turquoise blue Caribbean Sea. Sopa de lima; lime soup made with pieces of tortilla, chicken and lime juice. Cochinita Pibil; a slow roasted pork dish made by marinating the pork in citrus juice, coloring it with annatto seed and roasting the meat wrapped in banana leaves. Dulce de Papaya con Queso; papaya cooked in sugar and honey and served over edam cheese. Did you know that cocoa, or more specifically cacao, is an afrodisiac? The Mayans saw it as a restorative, mood-enhancing cure-all. They also used drinks like balche (Mayan Wine) and xtabentun (annis liqueur) among others to meditate and honor their gods and goddesses. Where can one try these delicious creations? The city of Mérida boasts countless authentic Yucatecan restaurants, from economical and simple to pricey and sophisticated. 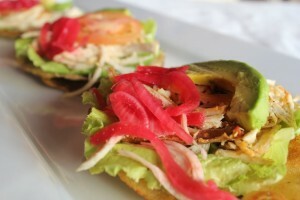 One great option is Los Almendros (calle 50A no. 493) or head over to the popular Eladio’s (calle 24) to order a cold Yucatecan beer. In Cancun you can also find a great variety of Yucatecan food at different prices, from street vendors to elegant hotels. Labna in Parque de las Palapas downtown is an exquisite restaurant, dedicated to Yucatecan specialties ideal for a romantic dinner. In our own Hacienda Tres Rios, we are fortunate to have one of the best chefs in the region, whose specialty is “la cocina Yucateca” (Yucatecan food) so during your next visit be sure to try some of Chef Oscar’s Yucatecan delights.